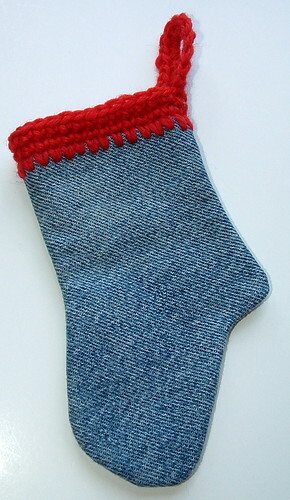 I know it may be early to start crafting for Christmas but I just had to share these mini recycled denim Christmas socks that I have been making. I used one of my crocheted small Christmas stockings as a template and traced around the sock to create the shape on a piece of paper. 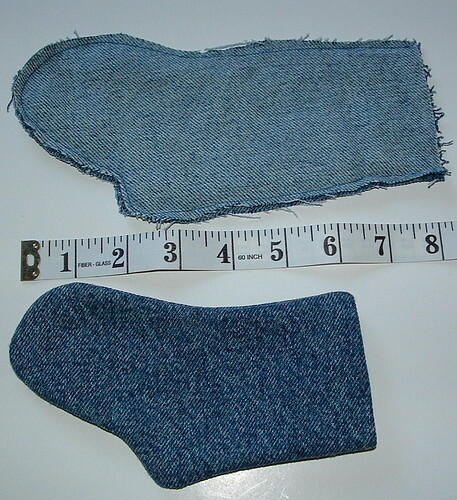 I then used the template to cut out two sock shapes from old denim jeans. 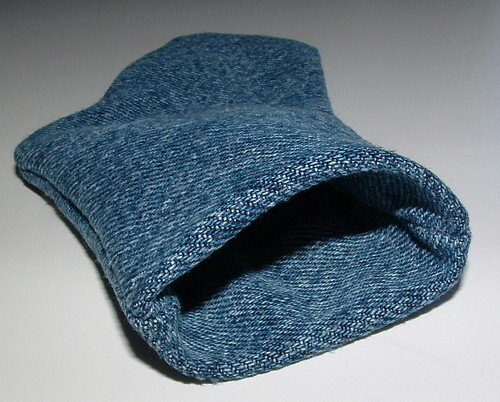 The sock shapes before sewing are about 8 inches long and 3-1/4 inches wide. 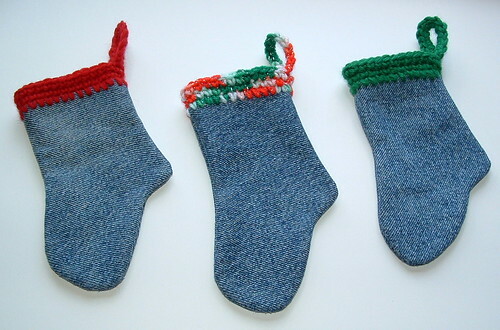 Just use a stocking shape you like and the size of your sock can be bigger or smaller depending on your preference. Put the right sides together and machine stitch a narrow seam around the sock. Leave the top edge unsewn as you will fold in the top edge about 2 inches to create a finished edge without having to sew along the top opening. The crocheted top and loop is then added to the top edge of the denim stocking. Below the denim sock is shown with the narrow hem sewn and before it was turned to the inside. The second sock has had the right sides turned to the outside and the top edge folded down inside. I used my crochet hook to push the edges out smoothly as the denim is stiff. Just run your crochet hook along the insides along the seams and in the toe and heel to push the corners out completely. Here is a picture showing the top edge turned to the inside to create the finished edge to begin the crocheted cuff. You can click on the photo to super-size it also. 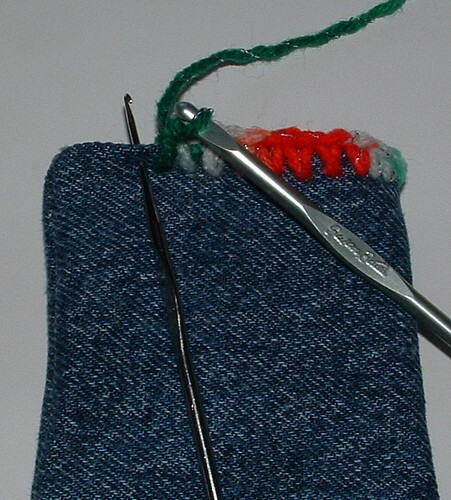 Using a steel crochet hook #7 and a G (4-4.25 mm) hook, attach yarn at the top near the back seam of the denim stocking. Single crochet (Sc) around evenly using the steel hook to make the hole through both layers of the denim top edge as shown in the picture. 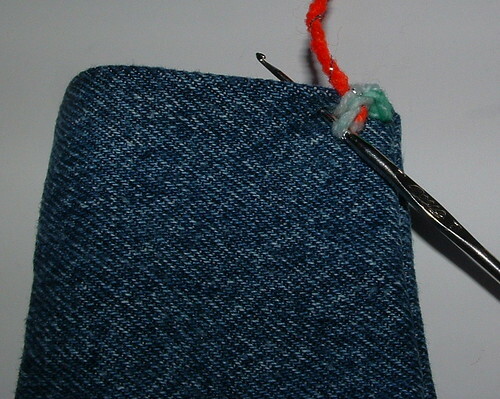 Once you get the steel hook through, you want to push the hook into the hole up to the wider part of the crochet hook to open up the hole so it’s easier to draw the yarn through the hole in the denim. I then used the G hook to actually make the single crochet stitch around the top edge. This first base round is slow going and pulling the yarn through the hole can be difficult. Use the steel crochet hook or a knitting needle to open up the hole more if necessary so you can pull the yarn through the denim. Once you have the yarn through the hole, just use the G hook to make your single crochet stitch. Crochet 3 rounds of single crochet (Sc) around the stocking for the cuff. Join with a slip stitch (sl st) at the back of the stocking to begin the loop. Chain 10 for hanging loop and attach in the next stitch at the back. Turn and Sc around the chain back to the beginning. Sl st into beginning stitch at back. Weave under ends. These are so cute and easy to make. I have some little friends who will like them. Thanks for sharing the pattern.